Land is King in Herefordshire, England’s most rural county, where buyers tend to be more impressed by the number of acres surrounding a country house than by the grandeur of the house itself. ‘Herefordshire is such a tightly held county that it’s practically unheard of for a family estate to be sold as a single unit,’ says Richard Binning of Savills (01242 548020) who recently launched the picturesque, 856- acre Letton Court farming and sporting estate between Hereford and Hay-on-Wye at a guide price of ‘excess £11 million’. It’s being offered as a whole as a going concern (a herd of suckler cows is included in the sale) by the vendor, who has lived there all his life, but is now retiring from farming. The estate, mentioned in the Domesday book, incorporates much of the ancient village of Letton and the land that surrounds it; the River Wye, famed for its trout and salmon fishing, forms its south-west boundary, from which a small tributary, known as Letton Lake, flows through the estate grounds. The previous Letton Court, historic family seat of the Blisset family, was built in a medieval style by the Rev Henry Blisset in 1859- 63, to the designs of the eminent church architect George Bodley. According to local records, ‘earlier houses on a nearby site, overlooking a park, were abandoned because of flooding’. In a scenario that’s the stuff of nightmares for all owners of historic houses, the red-brick Gothic mansion burned to the ground in the space of two hours on the morning of September 3, 1927, when most of the men in the village were away at Hereford market. The Hereford Times recalls the ‘prodigies of valour’ of the female household staff who tried desperately to control the blaze, which started when a blowtorch used by workers painting the outside of the house set fire to the woodwork and curtains of a spare bedroom, which ‘blazed up furiously in a high wind’. By the time the fire brigade arrived, the mansion was ‘doomed’, but they managed to save the north-east service wing, three strong rooms used to store silver and estate papers, and most of the wine-cellar. The present Letton Court, built shortly afterwards on raised ground nearby, is a handsome, well-planned, 7,782sq ft country house accessed via a bridge over an old moat and surrounded by 19th-century gardens and post-medieval parkland. 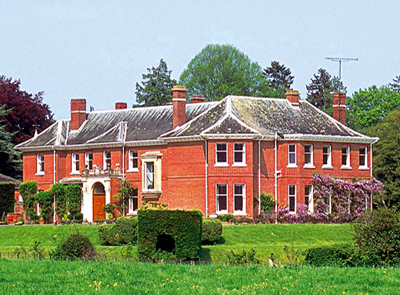 The four-square, red-brick, two-storey property has four fine reception rooms including a splendid drawing room, a kitchen and service wing, nine bedrooms, six bathrooms, offices and wonderful views of the lush Herefordshire countryside, with the wooded Bredwardine Hills, site of the legendary King Arthur’s Stone, in the background. As befits a country estate of impeccable provenance, Letton Court has an impressive array ofestate buildings, including clock tower and stable courtyards, and seven houses and cottages. The land, of which some 768 acres are arable and pasture, has been expertly farmed in hand, with excellent yields of wheat and barley recorded in recent years. The estate offers some two miles of single-bank salmon fishing on the middle Wye, and the chance to catch sea and brown trout, grayling, roach, perch or a huge pike of 30lbs or more. There is also an established duck and pheasant shoot, using the wooded spinneys, the River Wye and the Oxbow Lake for the main drives. The fishing rights are let until April 2013, and the shooting until February 2014. ‘There’s no shortage of buyers looking for a country house with 50 to 150 acres of land, especially since the recently proposed changes in planning legislation, and that just doesn’t happen around here. But everyone wants enough of a buffer to safeguard their privacy, and one of the first things they want to know is who owns the field in front, or that bit of land next door,’ says Anthony Clay of Knight Frank in Hereford. He is currently handling the sale of two classic Herefordshire country houses, both of which have enough land to allow their owners to sleep easily at night. Eyton Old Hall at Eyton, three miles from Leominster, stands in some 23 acres of 18th-century gardens and parkland, and was once part of the Eyton Hall estate owned by the Evans family. Previously known as Cranke Hall, after the name of its original owner, the early-18th-century hall had been renamed Eaton Hall by 1832, and Eyton Old Hall by 1885, by which time the Evanses had built themselves another grand new house on the estate. They moved back to the Old Hall some 90 years ago. The present owners of Eyton Old Hall have lived there for the best part of 20 years, but, having raised a large family on the premises, now find themselves ‘rattling around’ in this much loved Georgian house, listed Grade II, which has 7,690sq ft of accommodation, including four reception rooms, eight bedrooms and six bathrooms. Approached by a long drive through the park, it has glorious southerly views over rolling countryside towards the Welsh mountains. It has been well maintained, and comes with a range of outbuildings and a heated swimming pool. Knight Frank (01432 273087) quote a guide price of £1.45m for the hall, with a two-bedroom bungalow, built in the early 1900s and currently let, for sale separately at a guide of £250,000. Knight Frank and Jackson International (01432 344779) quote a guide price of £1.75m for Grade II-listed Cagebrook House, near Eaton Bishop, five miles west of Hereford, which stands in 34 acres of idyllic formal gardens, paddocks and woodland on the banks of the Cage Brook, where wild brown trout come to spawn from the nearby River Wye. The house was built by the Moore Green family in about 1720, and owned by them until the mid 1800s. The two-bedroom coach house to the north is older, and may have been the original house on the site. A county plan of 1786 shows two mills near Cagebrook House, one of which took water from its fishpond ‘via a complex series of leats set within woodland, now silted up, but appealing to 18th-century picturesque sensibilities’. A 1911 sale catalogue describes Cagebrook’s park as ‘studded with fine oak, elms, beech and other ornamental timber’, with pleasure grounds, an aviary and a kitchen garden. Cagebrook House itself was altered and extended in the 18th, 19th and early 20th centuries, and has been restored and renovated in recent years. Still handsome, if a little world-weary, it has accommodation on three floors, including four period reception rooms, a fine staircase, a splendid new garden room, nine bedrooms, five bathrooms, and a three-bedroom annexe that could easily be incorporated into the main house. Outbuildings include a stable block with loose boxes, a workshop, a hay barn and a timber shed.